Opplev en marokkansk middag og ta på showet på Fantasia Restaurant i Marrakech, en legendarisk 4-timers opplevelse. Slapp av på myke puter og prøv det klassiske kjøkkenet på Maghreb, som musikere, mage dansere og akrobater holder lyset. Se en dramatisk Rif-seremoni: motsatte stammene markerer hver gruppes beste ryttere, som skyter og stikker ut i en visning av krigermester. Ta med majestetiske arabiske hester, tradisjonelle sanger og en ørkenkaravan, og avslutt kvelden med et glimt av en mytisk flygende teppe. The food was amazing. Out of all places the food was very well prepared. The show is a different story. You struggle to find a seat and people we can territorial. It's to dark to enjoy. We've booked three tickets on the 19th of September and were having high hopes from the show. Unfortunately, the driver could not pick us up at the hotel, claiming that he could not access the place where it was located due to the narrow street and the market place and came 20 minutes late at our meeting point. The the emphasis was put rather on the dinner then on the performance although we would have wished to see more of the show it was more a 2/3 dinner and a 1/3 show experience. During the dinner several dancing groups came to dance around the table and were expecting some money afterwards. It was funny to dance with the first group but when the next three groups came along, it started to be annoying. The show lasted about 30 minutes, with some horseback riding acrobatics, a belly dancer and some fireworks. All in all, we spent there about 3 hours. The food was middels good, and a bit noisy. The driver was very sweet. He called us when we forgot the dinner and we manage to reach him. The show was good, however the total value for us was 3 stars. All driks was extra cost and if you take a picture of the horses close by, they want money. My daughter liked the show and food was really good. They could have used better lighting in the show. I was a little sceptical about this trip as thought it would be too touristy but I actually thoroughly enjoyed it and can see why so many people go. The transfer to Chez Ali is simple and straightforward and we were delivered to our tent for dinner where you get a table to yourself and enjoy multiple food courses as well as many different dancing groups, which are great entertainment and fun. The highlight though are the horseman at the end of the night and worth the wait. Thoroughly recommend this tour for all the family. My friend and I went to the dinner for our first night in Marrakech. It was a great way to start the trip. 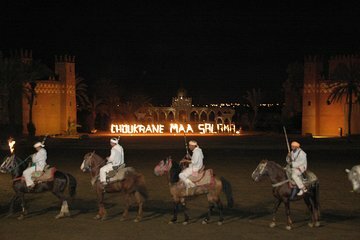 Fantastic show it is a must in your Marrakech visit . Après une bonne demie heure d'attente, deux changements d'horaire et de lieu de prise en charge nous avons eu droit à un circuit de ramassage qui a duré une heure quinze ! De toute façon, le spectacle était sur le point de débuter !! I had a blast! Wished the show was longer.